Dean Lizabeth Cohen awards Janet Yellen with the Radcliffe Medal. When it became clear in 2013 that she was a leading candidate to chair the Board of Governors of the Federal Reserve System, Janet Yellen turned to her predecessor for advice. 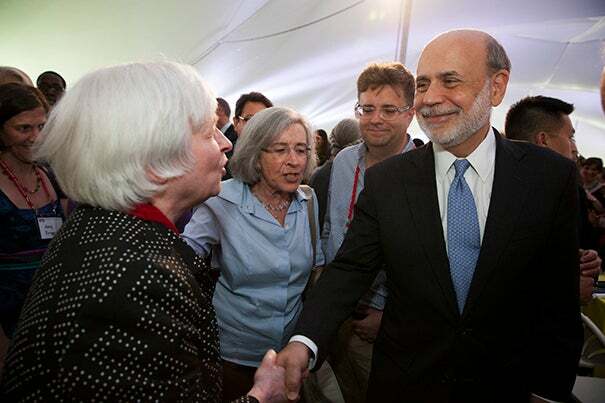 “It’s a tough job, I said, and it can be pretty thankless,” Ben Bernanke ’75 recalled telling Yellen, who was his second in command. But the comment didn’t dissuade her. With the U.S. Senate’s approval, she became the first woman to head the nation’s central banking system the following year. Those contributions were honored at the gathering. Yellen received the Radcliffe Medal during a luncheon in Radcliffe Yard for 1,300 attendees that included Radcliffe alumnae and fellows, recent College graduates, Harvard President Drew Faust, and U.S. Attorney General Loretta Lynch. 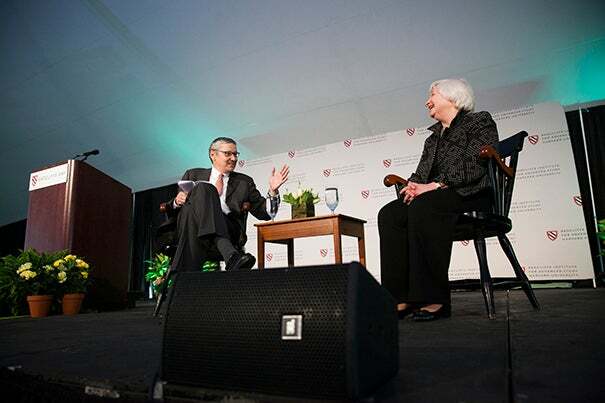 The afternoon’s festivities included a wide-ranging conversation between Yellen and Harvard’s Gregory Mankiw, Robert M. Beren Professor of Economics and former chair of the President’s Council of Economic Advisers. Offering her the chance to move markets, Mankiw asked Yellen the question on many people’s minds: Where are interest rates headed? The Fed chair treaded carefully with her answer. After earning her degree in economics from Brown in 1967, she received her Ph.D. in 1971 from Yale. She became an assistant professor at Harvard from 1971 to 1976 and later a lecturer at the London School of Economics and Political Science. She served on the Federal Reserve System‘s Board of Governors from 1994 to 1997 and as chair of President Bill Clinton‘s Council of Economic Advisers from 1997 to 1999. From 2004, until 2010, Yellen was president and chief executive officer of the Federal Reserve Bank of San Francisco. During her remarks, she praised Bernanke for his leadership during the 2008 financial crisis and his “inventive and innovative” approach to getting credit flowing back into the American economy, as well as for the Fed’s programs, asset purchases, and other efforts to get the economy back on its feet. Asked by Mankiw for advice to students in the audience, Yellen encouraged them to work in a field that they are passionate about and to do so in a place and with people who believe in the mission.